I think barred owl not grey. Thanks for the correction, you are 100 percent correct. 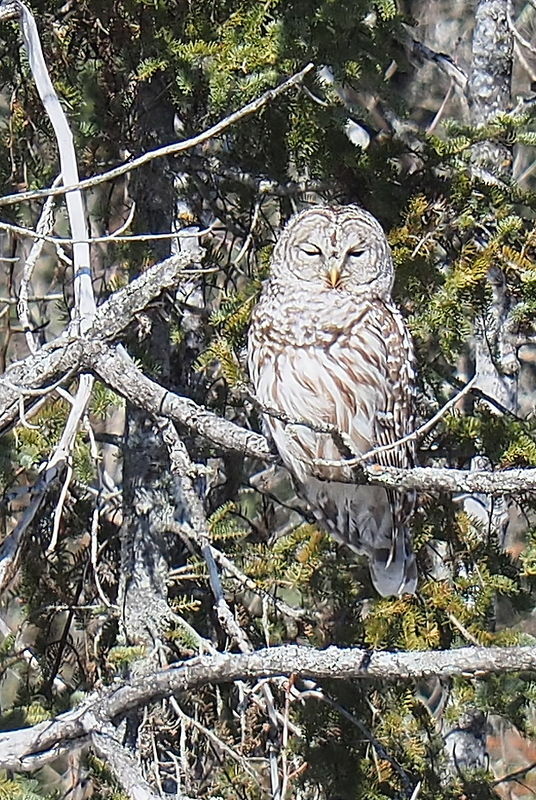 I have never seen a barred owl in our area. Thanks, it was quite a thrill to see it, just dozing there in the sun. I hope there is a nest nearby. So glad you got the shot then! i'd say that was a very productive and fun walk, jbruce...that's a gorgeous shot of a beautiful creature! We live along a little swampy river so have quite a few barred owls in our area and have heard several great horned, but would love to see a great grey, Bruce! Thanks for looking, I'm still experimenting with the m4/3 format, and it is proving to be very interesting thus far. Actually this barred owl was close to a "swampy little river", as well. This is the first time I recall of ever seeing this particular species.